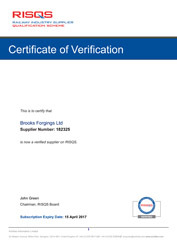 Approvals & Certifications - ©2019 Brooks Forgings Ltd.
Download a copy of our LRQA ISO 9001 : 2015 Certificate for your records. 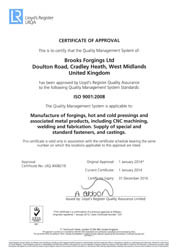 Download a copy of our LRQA CE Certificate, covering EN 1090 EXC 2, for your records. 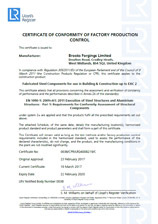 Download a copy of our LRQA CE Certificate, covering EN 15048-1, for your records. 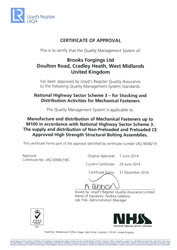 Download a copy of our LRQA National Highway Sector Scheme Certificate for your records. 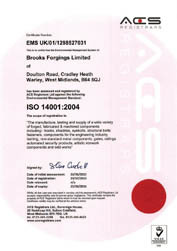 Download a copy of our ACS ISO 14001 Certificate for your records. 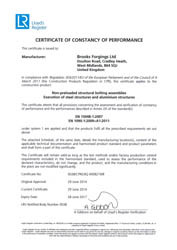 Download a copy of our ACS OHSAS 18001 Certificate for your records. Download a copy of our Achilles RISQS / Link-Up Registration Certificate for your records. 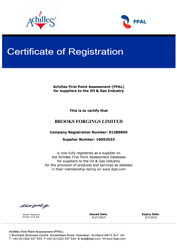 Download a copy of our Achilles FPAL Registration Certificate for your records.